Ford Daytona-Style 9" pinion support features a large rear bearing for increased strength and durability. Designed for continuous heavy duty applications (stock car, circle track and street use). Comes complete with large rear cup (TBAA-4616-A) or (HM89410) and small front cup (B7A-4614-A) or (M88010). 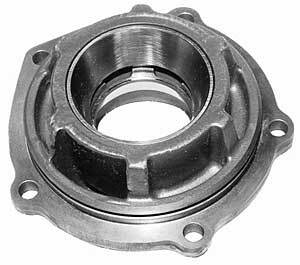 Use large rear bearing TBAA-4621-A (HM-89443) and small front bearing B7A-4621-A (M-88048) with these retainers.